Why sociological questions cannot be answered by Marxian theory, and vice versa. 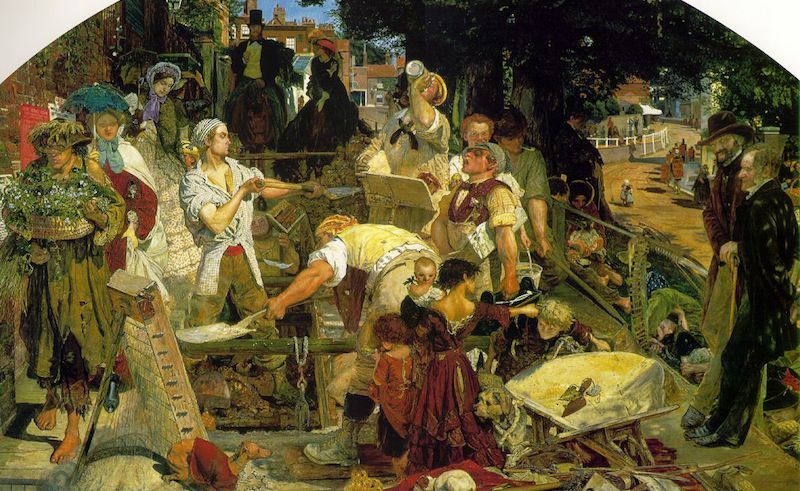 Ford Madox Brown, Work (1875). via Wikimedia Commons. First published in Global Dialogue. Max Weber in his General Economic History (1919-20) established that capitalism as a comprehensive system of satisfying everyday human needs was specific to the West, that its preconditions were rational calculation of capital (customarily, double-entry bookkeeping) as a norm in the case of all greater enterprises, and especially that: 1. all means of production should be distributed among independent private enterprises as freely disposable property; 2. there is need of a free market without “irrational” limitations such as caste (Stände) differences; 3. there is also need of rational, that is, thoroughly calculable, mechanized technology in the case of production, trade and transport; 4. there must exist a rational legal system, predictable and transparent; and 5. free labor must be available, that is, persons who are legally entitled to sell their labor force and also forced to sell it on the market, coerced by economic considerations. Marcel Mauss (in an encyclopedia article written with Paul Fauconnet in 1901) similarly established that nobody, for instance no individual worker or trader, could invent the forms of social life which are external to their minds, such as credit, interest, wage, exchange, or money. Even elements of social and economic life like diligence, thrift, a taste for luxury or adventure, fear of indigence, and “spirit of enterprise” are not wholly subjective, in spite of personal variations, but in general “objective” products of the “social culture,” itself a feature of the social system of Western capitalism. There is not much in all this a contemporary Marxist (or, for that matter, Marx himself) would disagree with, quite apart from the fact that sociology, being posterior to Marx, bears his imprint, although it is directed — in part — against his legacy. “Bourgeois” or Marxian analysis of Modern Society? What, then, is the fundamental difference between “bourgeois” sociology (and all the branches of social inquiry from empirical social research to political philosophy) and the Marxian analysis of modern society? What is the explanation of this protracted quarrel, probably as important historically as the contest of Enlightenment with metaphysics and theology? To simplify: Enlightenment turned from Aristotelian, Augustinian, and Thomist cosmic objectivity to a material subjectivity inaugurating the sovereignty of will as the principle of liberty. What in France had been called sciences morales et politiques are the consequences of the final, Kantian form of the critique of the grandiose arc of the old dogmatics that had dominated “Western” (including Byzantine, Jewish, and Islamic) thought since the Greeks. Both Spinozist and Kantian moral philosophy, regardless of their considerable differences, would recognize human beings as natural beings, subject to the causal determinations they share with rocks and fish, and their minds — limited by passions and particularly by the conatus sese conservandi — free in regard of moral choice but incapable of total, objective, impartial, and comprehensive knowledge and understanding, the obstacles being both logical and psychological. If the knowledge, deemed to be essential, of God is subjective — the gospels call this faith — then the “moral sciences” are bound to be subjective too. The common insight of the Renaissance, Reformation, and Enlightenment might be that the criterion of both knowledge and freedom is subjectivity examined by reason, this latter ultimately shaped by logic and mathematics. The hidden belief behind this was, of course, that the “reality” thus surveyed was available to intuition, subsequently re-examined by reason and expounded dialectically, that is, by demonstrating its contradictions. The historical role of Hegel was to show that what had been held to be subjective, “the spirit,” was in fact objective, that the mind creating concepts (rather than deducing them from the external world) described by Kant was not our subjective faculty limited by epistemological constraints and condemned to ignorance in the most decisive respect, but was — on the contrary — really the very source (or substance or substrate) of both knowledge and freedom. To complicate matters further, Hegel also proposed that objectivity came in two guises: the “objective spirit” proper — what we would call today “institutions” — which is another name for what he called, when young, positivity: “false objectivity” (to simplify again: reason without freedom) and the “absolute spirit” (reason as freedom: philosophy). It is this “objective spirit” that the true founder of sociology, Émile Durkheim called “society,” in other words, a human world totally alien to human intentions, choices, desires, etc., a world of structures yielding repetitive or permanent results, as all human aspirations reflect or express institutional structures, rather than molding them. These structures — called “facts” — are monads with no windows, their transformations are fortuitous, owing to unforeseen combinations or to external events. With Marx, stepping forward from Hegel, but also back to Kant, the duality of the empirical and of the transcendental reappears. What is presented as a “fact,” a “structure,” or a “thing” is an appearance, behind which subjectivity is hidden, most famously, labor (human productive activity) behind value (the guiding principle of the capital process); it is also labor that is petrified in the fetish “commodity.” Not things, but human subjective activities. The thing, the institutional “objective spirit” is a façade, hence the whole institutional logic of society (wherein the economy, the state, and “civil society” are no longer separated) is a façade too. But from the viewpoint of objectivity and subjectivity, even labor is split: concrete labor and abstract labor are not the same. Whatever appears directly, is a mirage always, whatever is essential is — as essences should be — concealed (in capitalism, false appearance wears the accoutrements of objectivity). It ought to be uncovered (conceptually destroyed) by theory (critical political economy, philosophy, whatever) in order to recapture the naturalness of subjective human activity where needs are not governed by value. Observed from the classical sociological perspective, the main point seems to be: how does the “absolute spirit” steer the “objective spirit,” i.e., what kind of social institutions appear as a result of what value does, or, what are the origin, the history, and the function of classes? Because sociology treats human groups as “things” (permanent or at least durable abstractions), it is interested in how human groups are shaped and distributed, what is their place on the larger canvas of the total society, and what is their relation to the state, the locus of intentional social-political change. Characteristically, Marx does not respond. In contradistinction to the early Communist Manifesto, he — and, in his footsteps, what is called “Western Marxism” — does not think that there are classes before and after capitalism. (Class is historical.) Class is an epiphenomenon of value and capital: “class cultures,” “class lifestyles,” and “class organizations” are epiphenomena of that epiphenomenon. The only class important to Marx is the proletariat which, in true Hegelian fashion, is constructed as a class that is not a part of (its own?) society. (A part which is not a part of the whole.) This is a denial of this class which is outside of the processes that are supposed to happen within society described by “bourgeois” social science (economy, politics) as interactions between people sharing a common humanity. But reification does not allow this. For it is the main activity of the proletarian that makes him or her into a thing, so this is not an interaction between classes but a quality of capital. Exploitation is not something the bourgeois are intentionally doing: surplus value is being appropriated to accumulate capital, not to harm workers. Exploitation is not something any state can suppress or remedy, so it is not a “political problem” as social democrats are wont to think. It is not inequality. Inequality is a sociological problem, but exploitation is not. Transforming reification, commodity fetishism, exploitation into inequality (hence, into a “political problem” capable of gradual improvement) is, for a Marxist, absurd. This is why, usually, sociological questions cannot be answered by Marxian theory, and vice versa.